JSTOR is database with full-text scholarly articles as well as some primary sources and ebooks from many different disciplines and subject areas. JSTOR is our only scholarly article database that has a substantial amount of content from before 1990. JSTOR often does not have articles from the past one to three years. Enter your college login and password if prompted. JSTOR has three ways to find articles - Basic Search, Advanced Search, and Browse. 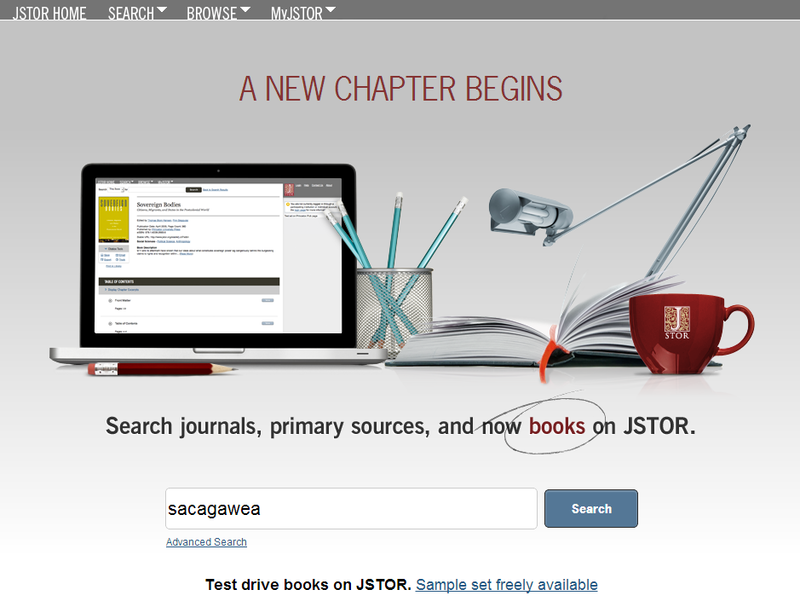 When you first log into JSTOR, you will see the Basic Search box. Simply enter your keywords and click the Search button. Of course you can use quotation marks around phrases and combine your keywords using AND, OR and NOT. For more information about that, see Using AND, OR & NOT to Combine Keywords. To get to Advanced Search, click the Search pull-down in the menu at the top and select Advanced Search. You can enter your keywords and combine them with AND, OR and NOT, quotation marks, and parentheses, just as you would in Basic Search. For more information about that, see Using AND, OR & NOT to Combine Keywords. Include links to external content - includes search results that have full-text content in another database or on the web. You should leave this option selected. Include only content I can access - eliminates search results with no full-text in JSTOR. Use this option carefully because it is easy to find out if the full-text is available in another database. Item Type allows you to narrow do your search by whether you want an article, an ebook, a pamphlet, etc. 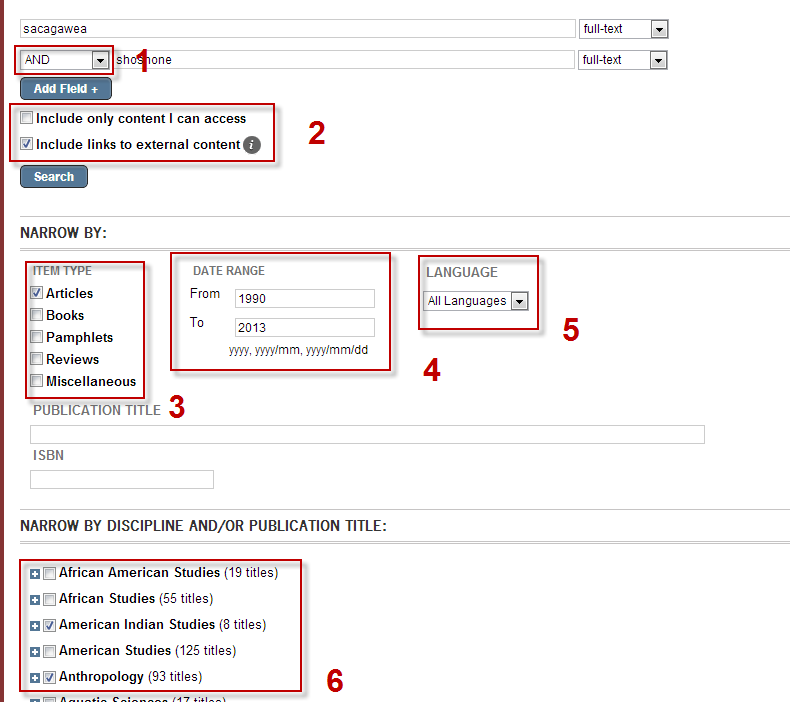 Check off the disciplines (subject areas) that you want to search down at the bottom of the Advanced Search page. Language lets you restrict your search to only documents in English (or another language). Ignore By Publisher unless you have a specific reason to use it! Once you do a search, you will get a results list. Click on the title of the article to view article information including authors, journal title, volume, and issue, an abstract (summary of content) and the permalink. JSTOR permalinks need to be edited in order to work. Here is how to do it. Click Article PDF to download the full-text of the article. Click the check box next to the search result to select it. Once you have selected all the articles you want, you can Save, Email or Export (using RefWorks) them in batches, if you are logged into your MyJSTOR account. On the right side of the Article Information page. Save the article to your computer or an external memory device. Email the article to yourself.